Teams that suffer from Zombie Scrum have huge trouble shipping fast. In part, this is often because a (total) lack of automation. Deployments are done manually, testing is done manually and repetitive work during development is done manually. But automating manual work can be a daunting task. Most teams agree that automation is important. But not knowing where to start with this ‘huge and important thing’, they keep pushing it into the future. In this post we offer a practical approach to get started with automation tomorrow. Automation is one of the cornerstones of Agile software development. The idea is that manual work is tedious, error-prone and therefore something you’re likely to do as infrequently as possible. This includes tasks such as testing your application and releasing a new version of your platform. But by doing this infrequently you lose a wonderful opportunity to rapidly gather important feedback on questions like “Are my components still integrating?” or “Can our codebase still be deployed to our server-environment, or has configuration changed?”. In short, you want to automate manual work to learn faster about what works and what doesn’t. “Yes, we know that automation is important. But we’re too busy now”. And I can’t blame them. Automation can feel like a daunting task. Especially for monolithic legacy applications. In the mind of a team, it tends to become this huge ball of tangled wires. Not knowing where to start, and not having the luxury of time, they keep pushing it into the future (“We’ll hopefully have some time after this big project”). These are just some of things that I’ve done manually at some point, and that has been automated at some later point. Pure developer happiness! Schedule a meeting room for about 3 to 4 hours and invite your team. Or a self-selected group of representatives if you have several teams. Make sure that the room is large enough for people to move around. Begin the session by explaining the purpose of the workshop; identify the first (or next) steps in automating manual work (like deployment and testing) that we can start with tomorrow. Start the workshop with a creative energizer to get people going. Plunging straight into the subject matter generally doesn’t work well. A fun energizer is to ask people to pair up and visualize the challenge of automation in a couple of minutes. The visualization can be done with LEGO, by drawing on a big piece of paper or some other creative means. When the pairs are done, review the creations with the entire group and identify recurring themes (and have a few laughs). Take around 20 minutes for this. Ask the group to silently write down all the manual tasks that they (themselves) do as part of the current development and deployment process. Write down one task per post-it. You can offer the examples from above to give inspire people. After about 10 minutes, ask everyone to put their post-its on a flip-over. Give people a brief moment to clarify their post-its. Cluster the post-its by affinity or similarity and remove duplicates. This helps us to quickly identify the tasks that are done by more than one person. Take around 15 minutes for this. Starting with the tasks that are done by more people, ask the group to estimate how much time this task takes (in minutes) and how often it is done per sprint (frequency). Write these numbers down on the post-it and multiply them ([number of people] x [time] x [frequency]) to arrive at the ‘cost’ of the task (also write that down). We’re not looking for scientific accuracy here, so keep the pace up. This is a great exercise to quantify the cost of manual work and identify tasks that would greatly benefit from automation but aren’t top-of-mind. Take about 30 minutes for this. 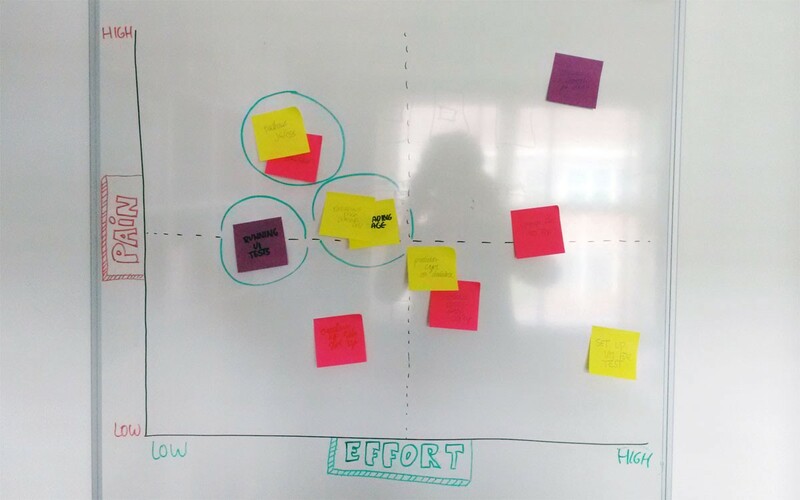 Beginning with the manual tasks in the quadrant high pain/low effort, ask the group to identify what needs to be done to automate this starting tomorrow (or next sprint). We often find it helpful to ask for ‘15% solutions’ to avoid getting stuck in finding the ‘100% solution’ (the perfect one). If manually checking a critical path of the application following a code change takes a long time, a ‘15% solution’ might be to create at least one manually-triggered UI-test with Selenium that does this for you. Triggering it automatically on a buildserver after every commit could be a next step. Depending on the number of tasks in the high pain/low effort quadrant, you can do this with the entire group or with smaller break-out groups that focus on a selection of items. Start with the low-hanging fruit (high pain/low effort), and move to low effort/low pain from there. Try to stay away from the ‘high effort’ tasks, unless the team really wants to also tackle some ‘bigger steps’ over the previous smaller ones. Limit this exercise to 60 minutes to keep it focused and tidy. Formulate the actions identified in the previous exercise into items that can be put on the Product Backlog (e.g. ‘Create per-environment transforms for configuration’, ‘Set-up CircleCI to integrate the code on every commit’ or ‘Setup Webpack to automatically bundle stylesheets and scripts’). Estimate them in story points (or whatever you use to estimate) and make sure they are INVEST. 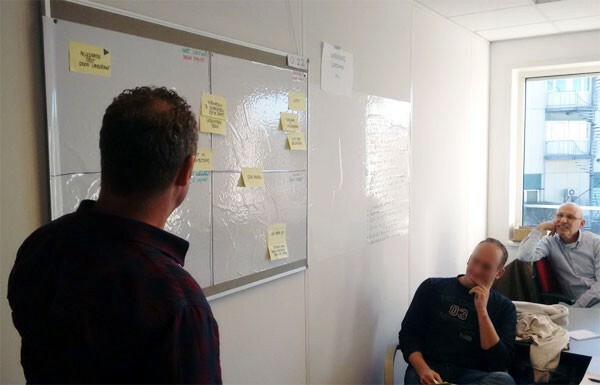 Make sure to discuss the improvements with the Product Owner, as he/she is ultimately responsible for what goes on the Product Backlog. If you’ve calculated the cost of every task as part of the workshop, you also have a pretty good business case. This workshop helps to break down automation into smaller, more manageable steps. Instead of working from a preferred future state, it starts from the things that hurt the most right now. By automating theses tasks first, the team saves time on the one hand and creates the foundation on which further automation can take place on the other. Let me know if you’ve done this workshop (or a variation of it) and made the first (or next) steps in automating parts of your development/deployment process.